You know it’s fall when . . . The breeze is cool even though the sun is shining. The sidewalks are littered with acorns. 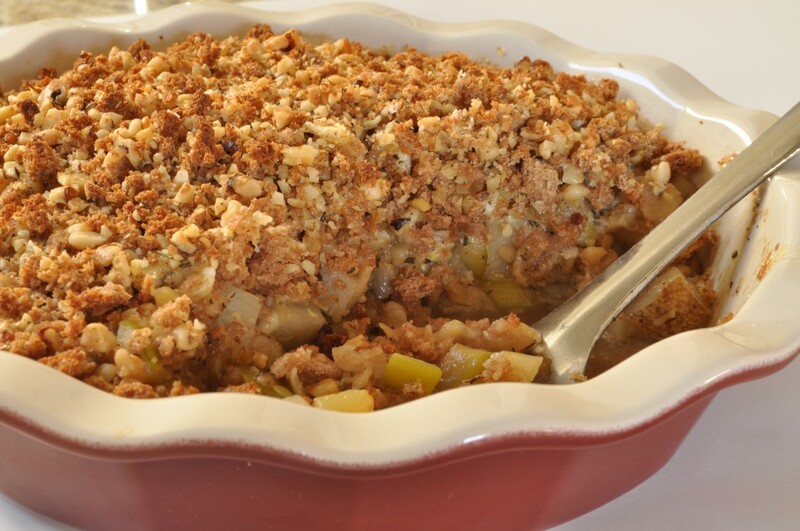 And a cozy dish of baked zucchini and potatoes, scented with rosemary and topped with a rough-hewn crust of breadcrumbs, walnuts, and cheese, does not seem like an odd choice for dinner, but like the most satisfactory meal that you could be eating. This savory crumble is from the September 23rd entry of Nigel Slater’s Kitchen Diaries. I saw the recipe when I was reading through the September chapter a week or so ago, and decided then and there that I would make the dish in celebration of its anniversary. I expected that it would feel out of place—I was still wearing sandals back then, and a hearty vegetable crumble seemed a bit presumptuously autumnal. But as the week went on the weather turned cooler, and yesterday, on my morning walk, I heard a familiar skittering sound against the pavement and a flock of dried leaves swirled past my feet. Fall is certainly on its way, and I am ready to welcome its flavors and cooking style to my kitchen. This crumble is a dish that will definitely make its appearance many times on my table during the season. It is one of those unpretentious dishes that sounds so simple—until you taste it and can’t believe how delicious it is. 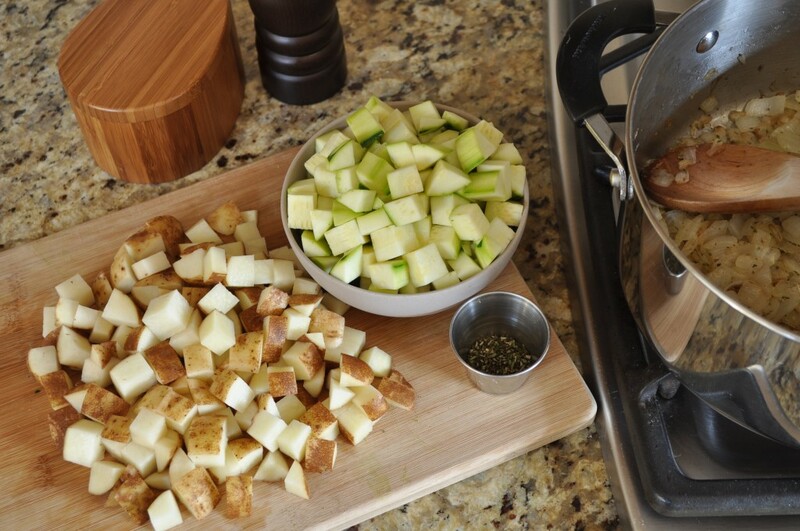 The dish starts off by gently cooking onions in butter until they are lovely and golden, then adding fragrant rosemary—the essence of fall in my opinion—and rough chunks of potatoes and zucchini. A bit of stock is added for moisture, and then the hot filling is poured into an ovenproof dish (I used a ceramic pie pan; Nigel used a cast-iron skillet) and sprinkled with a few generous handfuls of cheese. 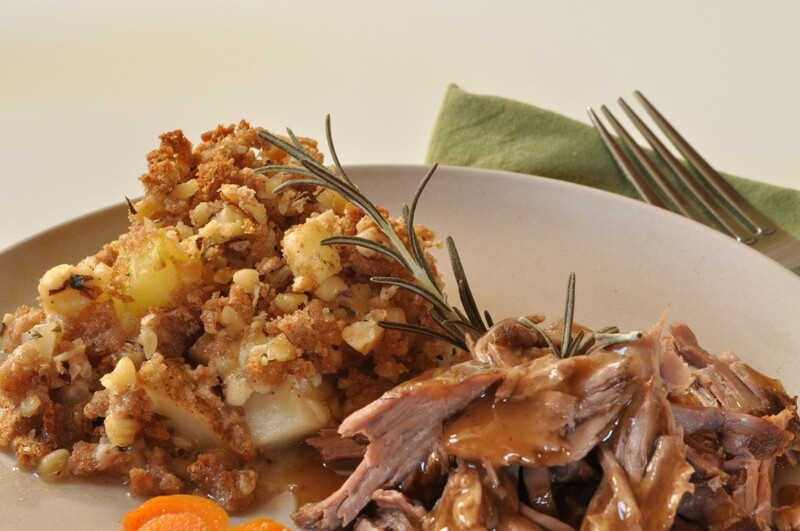 The whole dish is blanketed under a savory concoction of walnuts and breadcrumbs, enhanced with still more cheese and rosemary, and then baked until gorgeously crisp and golden. This dish can stand alone as a main dish, without any accompaniments. 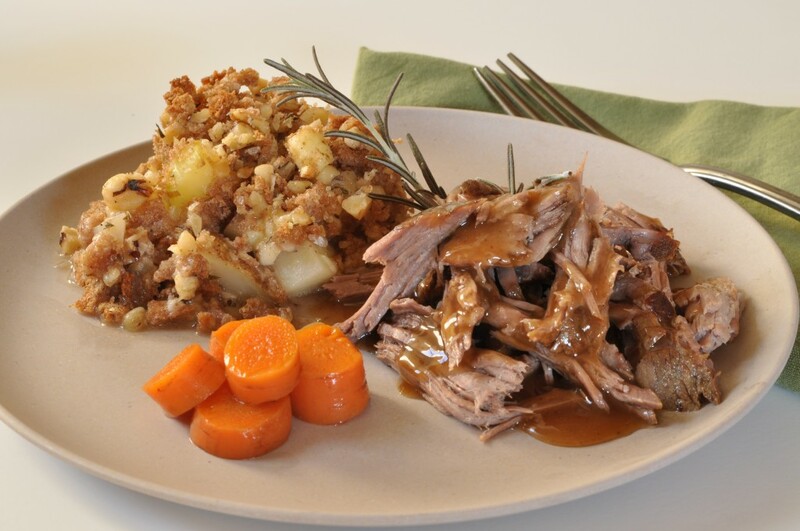 I served it alongside a pot roast, but the crumble was so good that it turned the meat into rather an afterthought. 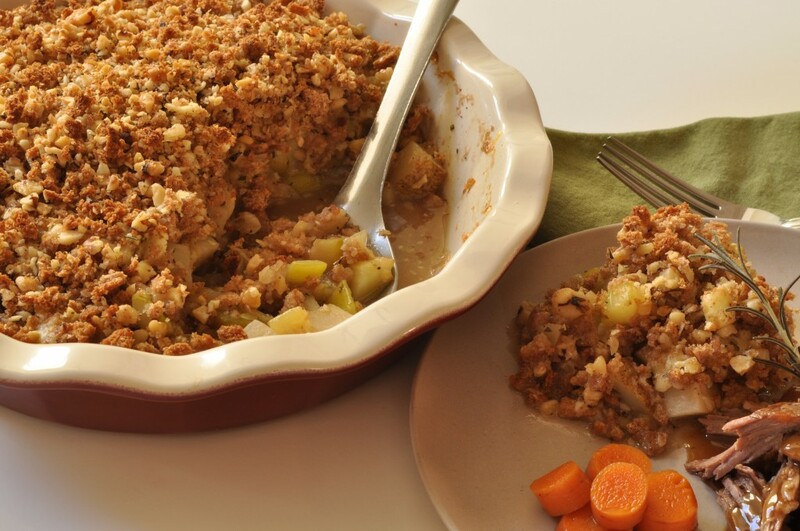 So if you only have time to make one dish for dinner, this crumble is your answer. Although I also think that it is the perfect side dish for an autumn feast. So for all of you up in Canada, keep this in mind as you plan for your upcoming Thanksgiving! For those of us who have to wait until November, don’t worry, I’ll remind you. Melt the butter in a Dutch oven over medium heat, add the onions, and slowly cook them until they are starting to caramelize, stirring occasionally. Chop the rosemary for both the filling and the crumble topping, and set aside one half of the chopped needles for the topping. Add the second half of the chopped rosemary to the cooking onions. 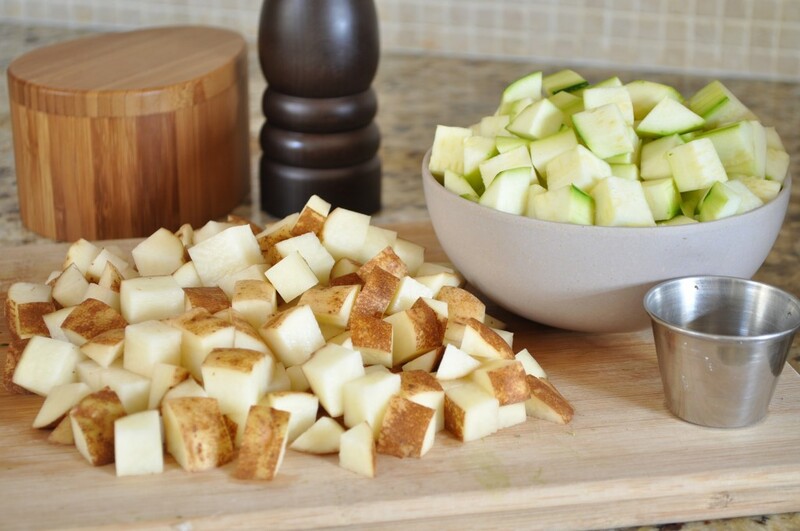 Wash the potatoes and then cut them into large dice, leaving the skin on. Add them to the pan and cover with a lid. Leave to cook for 10 minutes, stirring a few times to promote even coloring. Wash the zucchini and cut them into large dice as well. You can leave the skin on or peel them. 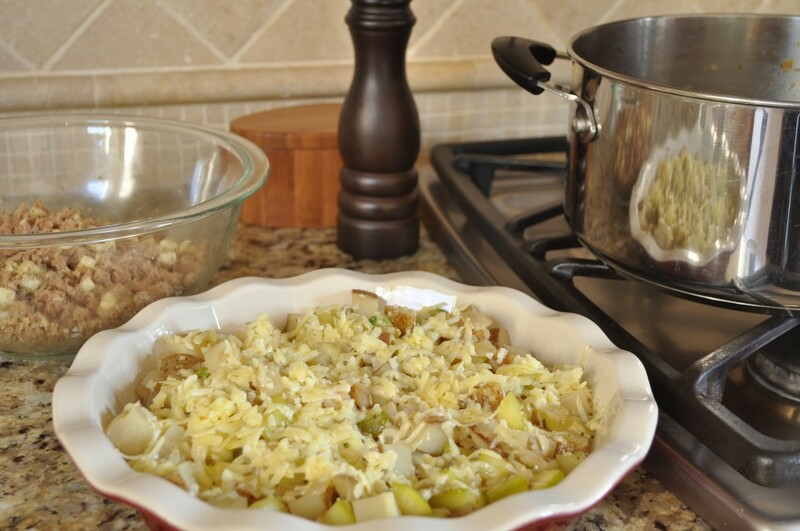 Stir the zucchini into the cooking potatoes and onions. Season with salt and black pepper. Put the lid back on and let the vegetables cook for a few more minutes. Then pour in the stock and bring up to a boil. 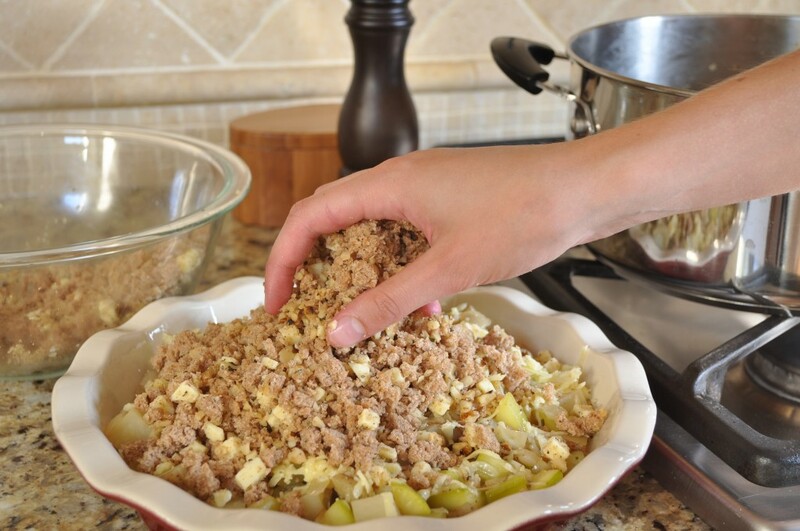 While the filling is cooking, prep the ingredients for the crumble topping. 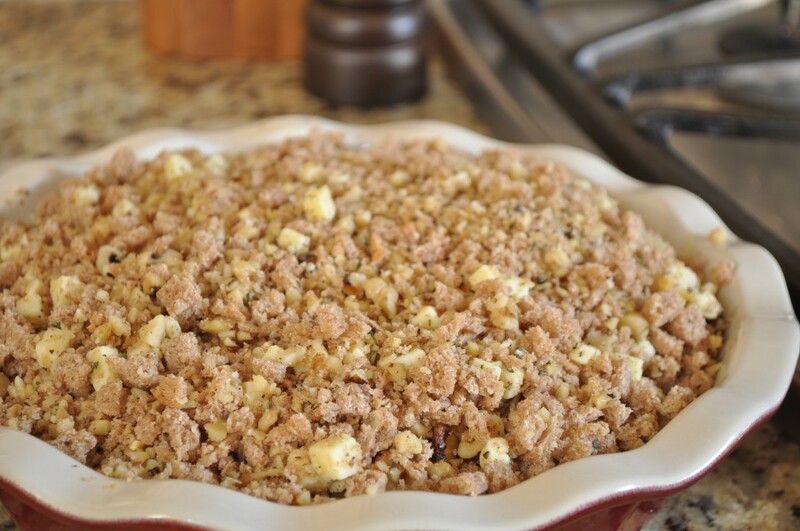 Then toss the breadcrumbs with the chopped walnuts, reserved rosemary, and crumbled cheddar. Season with salt and black pepper. Pour the hot filling into a deep-dish 9-inch pie plate and sprinkle the 2 oz. of grated cheddar over top. Then spread the crumble topping over that and pop the whole thing into the oven to bake for 40 minutes, until the top is crisp and browned and the filling is bubbling.